Compare with a pair of similar dishes illustrated by J. Ayers, The Baur Collection, Chinese Ceramics, vol. 3, Geneva, 1972, nos. 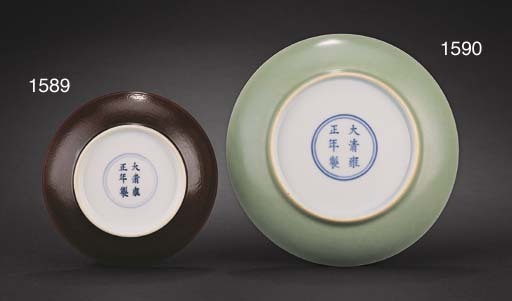 A476-477, where the author refers to the 'Yung Cheng List' of porcelains supplied to the Court which included both plain and incised purple-brown-glazed wares. Another pair is illustrated by R. Krahl, Chinese Ceramics from the Meiyintang Collection, vol. 2, London, 1994, no. 892; a single dish in the collection of the National Palace Museum is illustrated in the Catalogue of a Special Exhibition of Ch'ing Monochromes, Taiwan, 1981, no. 45; and another was included in the Min Chiu Society exhibition Monochrome Ceramics of Ming and Ch'ing Dynasties, Hong Kong Museum of Art, 1977, Catalogue no. 31. A pair of these dishes from the Goldschmidt and Jingguantang Collections were sold in these Rooms, 3 November 1996, lot 562; and another from the K. W. Woollcombe-Boyce and E. T. Hall Collections, was sold in our London Rooms, 7 June 2004, lot 200.